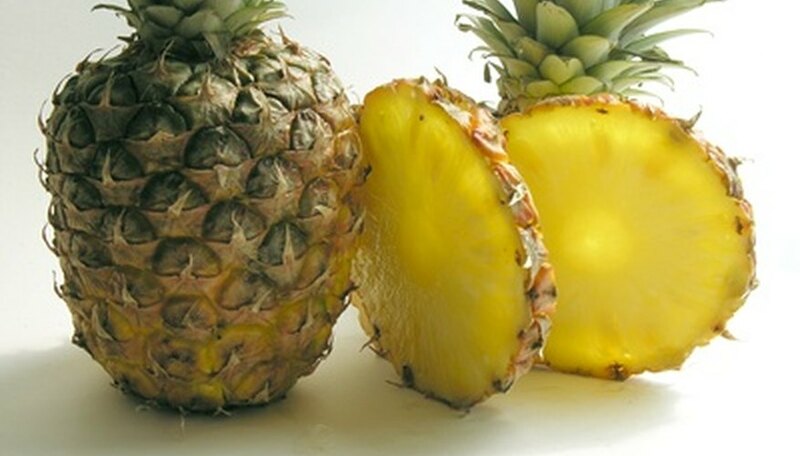 Unlike most other plants that require fertilizers up to two times a year, pineapples benefit from a regular and scheduled program that includes well-balanced fertilizer, iron treatments in accordance to the pH value of the soil and occasional doses of micro-nutrients. This sun-loving, exotic fruit cannot survive freezing temperatures and prefers well-drained, slightly acidic soil. Pineapple plants require two types of fertilizers—well-balanced and foliar fertilizers rich in micro-nutrients. In addition to these, plants in soils with pH value higher than 7.5 require iron supplements to raise the acidity needed to produce healthy fruit. Pineapple plants also benefit from shovelfuls of organic fertilizers such as compost incorporated into the soil at the time of planting to assist root development and improve water-retention capacity. Feed the pineapple plants a well-balanced fertilizer every two months for the first year. Add iron fertilizers six times a year, at the same time when applying the well-balanced fertilizer. Feed micro-nutrient fertilizers three times a year, preferably in warmer months of May, mid-July and September. These foliar sprays usually contain manganese and zinc, with traces of iron in some cases. According to the website of the University of Florida Horticultural Sciences Department, you should feed the pineapple plants a dry or liquid well-balanced fertilizer that contains 6 to 10 percent nitrogen, phosphorus and potash (N-P-K) along with 5 to 6 percent magnesium (Mg). Use up to 2 ounces of the fertilizer for the first two sessions, followed by 1 to 3 ounces for the third and fourth feeding sessions, and then between 3 to 6 ounces for the fifth and sixth session of the first growing year. Provide the plant the higher ratio (use 2 ounces instead of one) if using the lower-strength fertilizer (6-6-6), and conversely, use the lower ratio for a higher-strength 10-10-10 fertilizer. Follow label directions for applying foliar sprays containing micro-nutrients to avoid leaf burn. To provide iron to the plants, use chelated iron for a soil drench and iron sulfate if spraying over the leaves. Well-balanced fertilizers exist in granular and liquid forms. Scatter the granular or soil food around the base and water thoroughly to ensure it goes deep down. For foliar (liquid) sprays, make sure you pour the solution on the soil surface and over the base of the leaves. Avoid spraying or pouring the fertilizer in the center of the plant as young leaves are susceptible to injury. Direct the flow of spray over the plant and not on nearby furniture. For the second year of growth, feed the pineapple plants the well-balanced fertilizer every two months, as followed the previous year. Also provide six application of iron drenching to make highly alkaline soils acidic. Increase ratios of the well-balanced N-P-K fertilizer to between 3 to 6 ounces for the first four months of the third year, and between 5 to 8 ounces for the remaining months. Continue the three applications per year of the micro-nutrient sprays in the warm months.